The Wandering Minstrel Music School was founded by Steve Rennie in 1982. Working out of his home in Meadowvale, Steve would travel from home to home teaching guitar lessons. The studio grew rapidly in those early years, and new staff were added to meet the growing demand. Unfortunately late one night the music school was broken into and two guitar were stolen. After the theft, Steve decided it was time to move his young family back to North Bay. In 1989 Steve sold the music school to one of his staff, piano teacher, Judy Dadd. 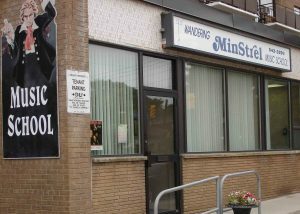 After a year on Old Pine Street, Judy moved the Wandering Minstrel moved to its current location at 16 Main Street on the Streetsville Village Square. The new location had lots of potential and over 1,300 sq ft. of studio space. 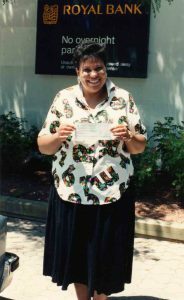 Over the years there have been many changes to the space, including a major renovation, a roof repair and new windows. With large front windows that let in tons of natural light, it’s a great space to learn in. 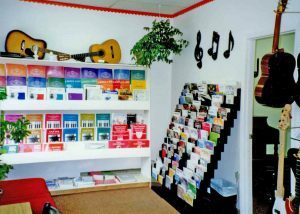 Over the past 34 years, the Wandering Minstrel Music School has taught over 5,000 students how to play a musical instrument or sing. Students have ventured from Etobicoke, Oakville and Burlington to study with our teachers. With a current staff of 14 teachers with proper credentials and teaching experience, you can learn to sing, play the piano, keyboard, guitar, saxophone, flute, clarinet, violin or viola. We have five spacious and comfortable teaching rooms. Many music schools have cramped rooms just big enough to the fit the equipment and two people. 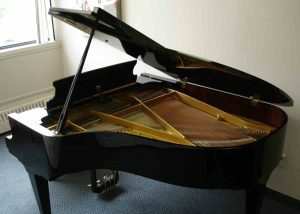 In fact, you’d be surprised to learn that many music schools don’t have grand pianos because their rooms are too small. But we have space for not one, but two grand pianos – a Kurzweil digital baby grand, and a 5’ 10” Schimmel grand piano, one of the world’s top piano brands. For our most advanced and serious piano students, the Schimmel offers them the opportunity to play the most demanding piano pieces at concert level. For the last 31 years our studios have provided thousands of lessons to the community.Our students have won first prize in competitions, received outstanding marks on their RCM exams, won music scholarships and some have become professional musicians. Read our page “Success Stories” to learn more about our students’ accomplishments. Feel free to call Judy with any questions you may have about our school, instructors, or methods of teaching.